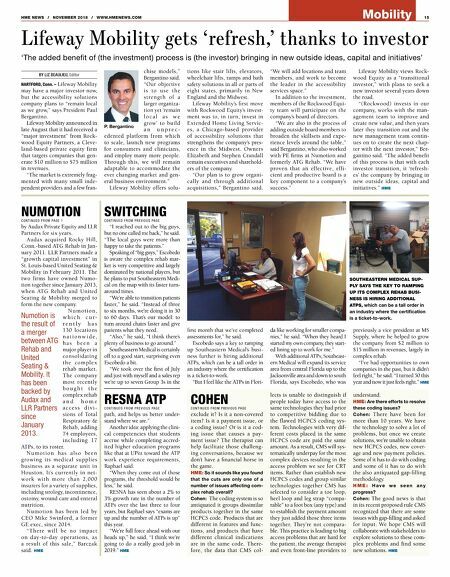 Mobility HME NEWS / NOVEMBER 2018 / WWW.HMENEWS.COM 15 Lifeway Mobility gets 'refresh,' thanks to investor BY LIZ BEAULIEU, Editor HARTFORD, Conn. – Lifeway Mobility may have a major investor now, but the accessibility solutions company plans to "remain local as we grow," says President Paul Bergantino. Lifeway Mobility announced in late August that it had received a "major investment" from Rock- wood Equity Partners, a Cleve- land-based private equity firm that targets companies that gen- erate $10 million to $75 million in revenues. "The market is extremely frag- mented with many small inde- pendent providers and a few fran- chise models," Bergantino said. "Our objective is to use the strength of a larger organiza- tion yet 'remain l o c a l a s w e grow' to build a n u n p r e c - edented platform from which to scale, launch new programs for consumers and clinicians, and employ many more people. Through this, we will remain adaptable to accommodate the ever changing market and gen- eral business environment." Lifeway Mobility offers solu- tions like stair lifts, elevators, wheelchair lifts, ramps and bath safety solutions in all or parts of eight states, primarily in New England and the Midwest. Lifeway Mobility's first move with Rockwood Equity's invest- ment was to, in turn, invest in Extended Home Living Servic- es, a Chicago-based provider of accessibility solutions that strengthens the company's pres- ence in the Midwest. Owners Elizabeth and Stephen Crandall remain executives and sharehold- ers of the company. "Our plan is to grow organi- cally and through additional acquisitions," Bergantino said. "We will add locations and team members, and work to become the leader in the accessibility services space." In addition to the investment, members of the Rockwood Equi- ty team will participate on the company's board of directors. "We are also in the process of adding outside board members to broaden the skillsets and expe- rience levels around the table," said Bergantino, who also worked with PE firms at Numotion and formerly ATG Rehab. "We have proven that an effective, effi- cient and productive board is a key component to a company's success." Lifeway Mobility views Rock- wood Equity as a "transitional investor," with plans to seek a new investor several years down the road. "(Rockwood) invests in our company, works with the man- agement team to improve and create new value, and then years later they transition out and the new management team contin- ues on to create the next chap- ter with the next investor," Ber- gantino said. "The added benefit of this process is that with each investor transition, it 'refresh- es' the company by bringing in new outside ideas, capital and initiatives." HME 'The added benefit of (the investment) process is (the investor) bringing in new outside ideas, capital and initiatives' P. Bergantino NUMOTION C O N T I N U E D F R O M PA G E 1 by Audax Private Equity and LLR Partners for six years. Audax acquired Rocky Hill, Conn.-based ATG Rehab in Jan- uary 2011. LLR Partners made a "growth capital investment" in St. Louis-based United Seating & Mobility in February 2011. The two firms have owned Numo- tion together since January 2013, when ATG Rehab and United Seating & Mobility merged to form the new company. N u m o t i o n , w h i c h c u r - r e n t l y h a s 130 locations n a t i o n w i d e , h a s b e e n a major player in consolidating the complex rehab market. The company most recently b o u g h t t h e complex rehab a n d h o m e a c c e s s d i v i - sions of Total Respiratory & Rehab, adding 74 employees, including 17 ATPs, to its roster. N u m o t i o n h a s a l s o b e e n growing its medical supplies business as a separate unit in Houston. It's currently in net- work with more than 2,000 insurers for a variety of supplies, including urology, incontinence, ostomy, wound care and enteral nutrition. Numotion has been led by CEO Mike Swinford, a former GE exec, since 2014. "There will be no impact on day-to-day operations, as a result of this sale," Barczak said. HME "I reached out to the big guys, but no one called me back," he said. "The local guys were more than happy to take the patients." Speaking of "big guys," Escobedo is aware the complex rehab mar- ket is very competitive and largely dominated by national players, but he plans to put Southeastern Medi- cal on the map with its faster turn- around times. "We're able to transition patients faster," he said. "Instead of three to six months, we're doing it in 30 to 60 days. That's our model: to turn around chairs faster and give patients what they need. "Also," he said, "I think there's plenty of business to go around." Southeastern Medical is certainly off to a good start, surprising even Escobedo a bit. "We took over the first of July and just with myself and a sales rep we're up to seven Group 3s in the first month that we've completed assessments for," he said. Escobedo says a key to ramping up Southeastern Medical's busi- ness further is hiring additional ATPs, which can be a tall order in an industry where the certification is a ticket-to-work. "But I feel like the ATPs in Flori- da like working for smaller compa- nies," he said. "When they heard I started my own company, they start- ed lining up to work for me." With additional ATPs, Southeast- ern Medical will expand its service area from central Florida up to the Jacksonville area and down to south Florida, says Escobedo, who was previously a vice president at MS Supply, where he helped to grow the company from $2 million to $15 million in revenues, largely in complex rehab. "I've had opportunities to own companies in the past, but it didn't feel right," he said. "I turned 50 this year and now it just feels right." HME SWITCHING C O N T I N U E D F R O M P R E V I O U S PA G E SOUTHEASTERN MEDICAL SUP- PLY SAYS THE KEY TO RAMPING UP ITS COMPLEX REHAB BUSI- NESS IS HIRING ADDITIONAL ATPS, which can be a tall order in an industry where the certification is a ticket-to-work. RESNA ATP C O N T I N U E D F R O M P R E V I O U S PA G E path, and helps us better under- stand where we are." Another idea: applying the clini- cal competencies that students accrue while completing accred- ited higher education programs like that at UPitt toward the ATP work experience requirements, Raphael said. "When they come out of those programs, the threshold would be less," he said. 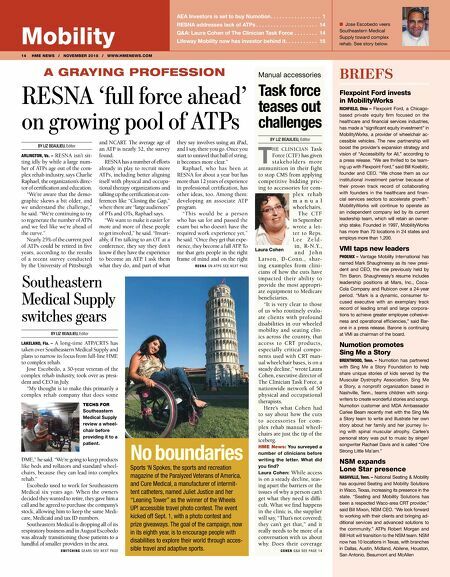 RESNA has seen about a 2% to 3% growth rate in the number of ATPs over the last three to four years, but Raphael says "exams are up and the number of ATPs is up" this year. "We're full force ahead with our heads up," he said. "I think we're going to do a really good job in 2019." HME COHEN C O N T I N U E D F R O M P R E V I O U S PA G E exclude it? Is it a non-covered item? Is it a payment issue, or a coding issue? Or is it a cod- ing issue that causes a pay- ment issue? The therapist can help facilitate those challeng- ing conversations, because we don't have a financial horse in the game. HME: So it sounds like you found that the cuts are only one of a number of issues affecting com- plex rehab overall? Cohen: The coding system is so antiquated it groups dissimilar products together in the same HCPCS code. Products that are different in features and func- tions, and products that have different clinical indications are in the same code. There- fore, the data that CMS col- lects is unable to distinguish if people today have access to the same technologies they had prior to competitive bidding due to the flawed HCPCS coding sys- tem. Technologies with very dif- ferent costs placed in the same HCPCS code are paid the same amount. As a result, CMS will sys- tematically underpay for the most complex devices resulting in the access problem we see for CRT items. Rather than establish new HCPCS codes and group similar technologies together CMS has selected to consider a toe loop, heel loop and leg strap "compa- rable" to a foot box (any type) and to establish the payment amount they just added those three items together. They're not compara- ble. This practice is leading to big access problems that are hard for the patient, the average therapist and even front-line providers to understand. HME: Are there efforts to resolve these coding issues? Cohen: There have been for more than 10 years. We have the technology to solve a lot of problems, but once we create solutions, we're unable to obtain new HCPCS codes, new cover- age and new payment policies. Some of it has to do with coding and some of it has to do with the also antiquated gap-filling methodology. H M E : H a v e w e s e e n a n y progress? Cohen: The good news is that in its recent proposed rule CMS recognized that there are some issues with gap-filling and asked for input. We hope CMS will collaborate with stakeholders to explore solutions to these com- plex problems and find some new solutions. HME Numotion is the result of a merger between ATG Rehab and United Seating & Mobility. It has been backed by Audax and LLR Partners since January 2013.